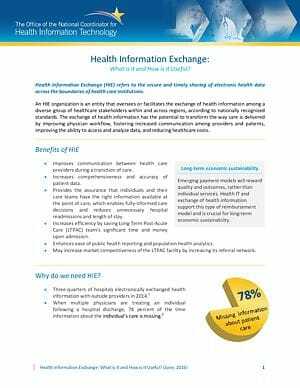 How does Health Information Exchange affect your practice? Electronic health information exchange allows doctors, nurses, pharmacists, other health care clinicians, and patients to access and securely share essential medical information electronically. This has the potential to improve the speed, quality, safety, and cost of patient care. Historically most Americans’ medical information was stored on paper — in filing cabinets at various medical offices, or in boxes and folders in patients’ homes. There has been a tremendous push over the past several years to digitize the health care experience and to allow for increased accessibility and portability of health information. What is the Trusted Exchange Framework and Common Agreement (TEFCA)? 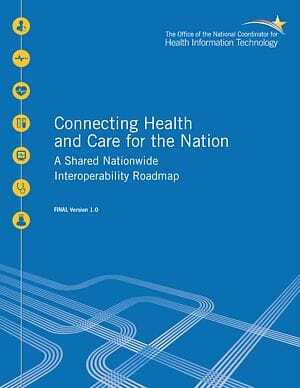 The Trusted Exchange Framework and the Common Agreement will outline a policy and technical approach for nationwide electronic health information exchange. TEFCA is mandated as part of the 21st Century Cures Act. Once finalized, it will allow clinicians and other health care providers to access patient health data from a variety of health information networks (HINs). Health care practices will only have to connect to 1 HIN in order to access patient information from HINs across the country. Being able to access this information can ensure patient safety and better care quality — especially when providing unplanned care. 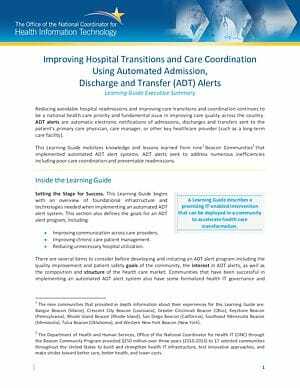 Learn more about the basics of health information exchange. 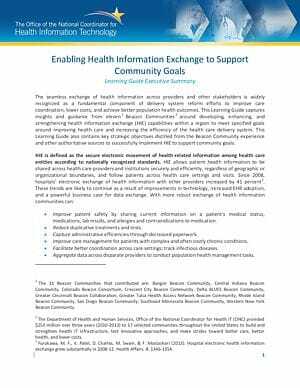 The following resources are designed to support health information exchange in your practice and community. 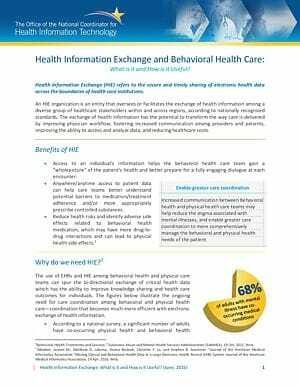 Can clinical health information exchange improve communication, early intervention, and care coordination in your area? 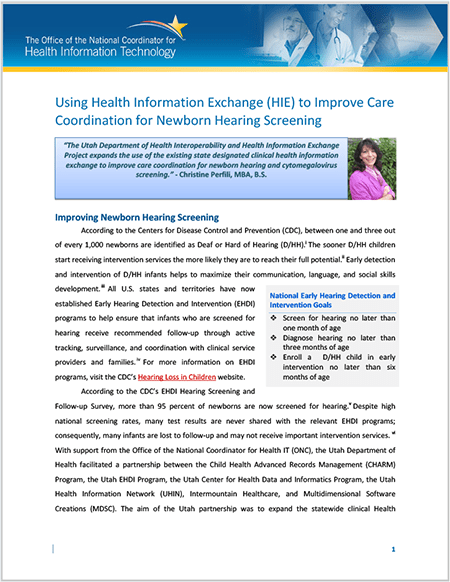 Learn how health care organizations in Utah worked together using clinical health information exchange to support state-wide infant-hearing screening. The following value propositions for Behavioral Health, Emergency Medical Services (EMS), Long-term and Post-Acute Care (LTPAC), and general clinician services are only a few examples that further demonstrate the need for HIE in specific care settings. 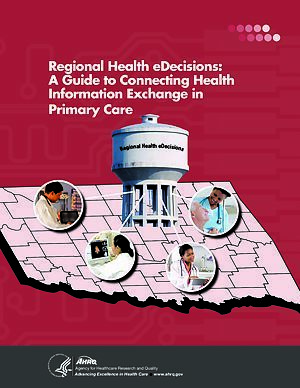 Can health information exchange improve care coordination in other health care settings? 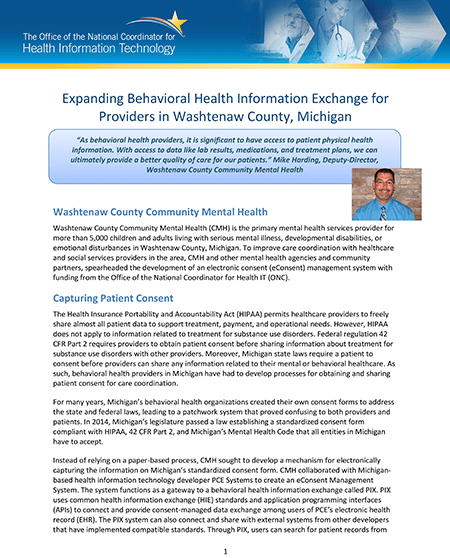 Learn how Washtenaw County Community Mental Health developed an electronic patient-consent management system to improve care coordination with health care clinicians, other mental health agencies, and community stakeholders. Clinicians use Directed Exchange to easily and securely send patient information — such as laboratory orders and results, patient referrals, or discharge summaries — directly to another health care professional. Health care professionals, who already know and trust each other, send this information over the internet in an encrypted, secure, and reliable way; it’s commonly compared to sending a secured email. This form of information exchange enables coordinated care that benefits both clinicians and patients. If a clinician receives laboratory results electronically and incorporates them into an electronic health record (EHR) they can, for example, generate a list of patients with diabetes. The clinician can then determine which of these patients have uncontrolled blood sugar and schedule necessary follow-up appointments. 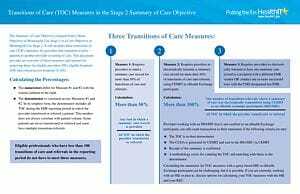 Clinicians also use Directed Exchange to send immunization data to public health organizations, or to report quality measures to The Centers for Medicare & Medicaid Services (CMS). The following resources will support your efforts to implement Directed Exchange in your practice and community. The following interactive courses include stories, analogies, and practical examples to highlight new vocabulary, content, transport, and services standards. These training courses also introduce the concept of interoperability building blocks and use stories to show concepts in practice. A transition of care is the movement of a patient from one clinician or clinical setting of care to another clinician or setting of care. For example, a transition of care occurs when a primary care clinician (PCP) refers a patient to a specialist, or when a hospital discharges a patient to another care setting. In many cases, but not all, a transition of care is permanent. For example, when a clinician discharges a patient from an inpatient setting, the discharging clinician expects that the patient will not return. When a PCP refers a patient to a specialist, such a referral is a transition of care; however, the PCP typically expects the patient to return for subsequent follow-up care. A patient’s transition in care gives both the sending and receiving clinicians an important opportunity to exchange patient information and reduce gaps in care. Having relevant patient information available when a patient transitions lets clinicians reconcile medications and other clinical information when patients transfer to their new setting. Standards, in the context of health IT, refer to agreed-on file formats for electronic documents, messages, and other healthcare related data elements. 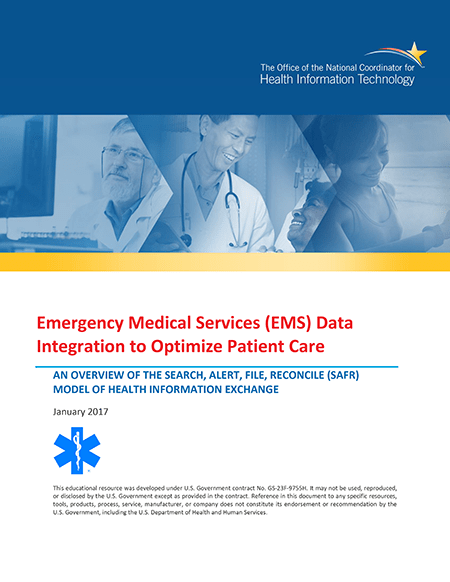 These standard formats allow for the creation of electronic messages that are exchanged between different health IT systems, which make interoperability and health information exchange possible. Terminology standards: Terminology standards specify which terms are to be used in a particular clinical domain and how each term in the system is defined (e.g., “weight” versus “birth weight” versus “dosing weight”). Terminology standards also define the vocabulary or code sets that pertain to a particular clinical domain or data type. Content standards: Content standards define the structure (syntax) for information that may be packaged for exchange. Content standards may define the data to be included, define the document structure, or include metadata about the information to be exchanged. Transport standards: Transport standards specify how data are to be packaged and transported between systems. Successful transport between systems leads to the ability of disparate systems to work together (interoperability). Transport standards often define “how” information is exchanged (the method by which information moves from point A to point B). Other standards include security standards and process standards that are not unique to healthcare — such as security standards for accessing the internet or process, or quality standards for ensuring products or services consistently meet customer requirements. Successful exchange of electronic messages — using standards listed above — between systems leads to the ability of disparate systems to work together (interoperability). 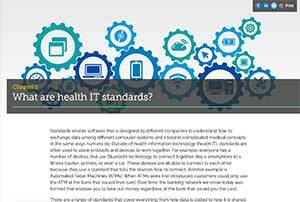 Learn more about how health IT standards are developed and maintained by Standards Development Organizations (SDOs). 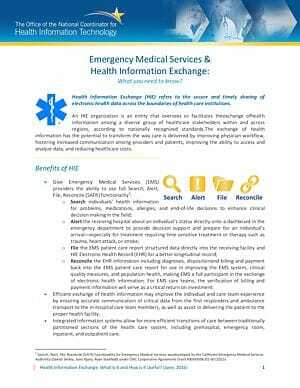 Share information securely with electronic health information exchange. Do you have a tip or suggestion for using electronic health information exchange that's worked well in your practice? Share it here!